The views here are almost indescribable. There's a 270-degree panorama including Half Dome, Clouds Rest, the waterfalls of the Mist Trail, dozens of peaks in the eastern Sierra range, and much of Yosemite Valley. It's probably the best place in all of Yosemite for watching the sunset. This hike is at the outer bounds of the easy category, since it involves some ascent, but it's well worth it. 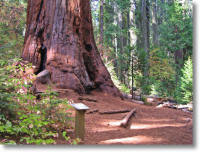 It includes the Grizzly Giant, which is not only the world's oldest sequoia, at 2,700 years, but also one of the world's largest living things; the California Tunnel Tree, which you can walk through; the Bachelor and Three Graces (pictured here); and a variety of other behemoths that would merit their own parks anywhere else in the world but don't even rate their own names here. There's no place like a meadow for chilling out, and this one is Yosemite's best. Just meander around the trails and soak up the sun (it feels good when you're at 8,500 feet/2,550 meters elevation) and enjoy the wildflowers and the river and the deer and the granite peaks surrounding the meadow. Hike to the base of the tallest waterfall in North America and absorb some of the adrenaline-soaked spray that's just survived a 2,400-foot (720-meter) freefall. Best in the spring and early summer, when there's lots of water roaring over the falls. If you've ever wanted to step into a postcard, come to Tenaya Lake. The lake is beautiful enough by itself, but it's also got beaches along the eastern and western shores and is surrounded by striking granite domes and peaks. Sentinel Dome is at the upper end of the easy category, due to the short but steep foray up the side of the dome to the summit. Once there, though, you'll find 360 degrees of view encompassing Yosemite Valley, the high Sierras, and (on unusually clear days) the coastal range. A short walk to the base of this 620-foot (189-meter) waterfall that's one of the most famous in the world, photographed millions of times from Yosemite's tunnel view. Heart-starting views over the very sheer edge of the south rim of Yosemite Valley, with only the most basic of guardrails to hold you up. After you've driven to Yosemite Valley and gotten out of your car to look at El Capitan just because it's too tall to see the top of through your windshield, hike to Taft Point so you can look down on it instead. This nearly flat hike takes you through two meadows in the heart of Yosemite Valley, crosses the Merced River twice - including a trip over the iconic Swinging Bridge (at left) - and provides multiple views of Yosemite Falls and Half Dome. Not only that, but the trail goes directly past the Lower Yosemite Falls trailhead AND a bar. Head-swiveling panoramic views to Half Dome and Clouds Rest in the west and Tenaya Lake in the east. Ringed by picturesque granite domes dotted with glacial erratics. And you can see most of it without leaving the parking lot. Sure, these didn't make the top 10, but that doesn't mean they're not worthy of your footprints - it's just that this is Yosemite, where the standards are higher. If you had any of these in your backyard, you know what people would call you? Homeless. Because your property would be condemned so they could turn it into a national park. This hike readily fits in the "easy" category; in fact, it's a stretch to consider it a hike at all, since the approach consists entirely of descending a staircase. Similar views to Glacier Point, but with a profile rather than frontal view of Half Dome, and with an added view of Illilouette Falls. This mostly flat loop around the edge of one of Yosemite's largest meadows is an archetypal daydreamy stroll, especially during wildflower season just after a rainstorm. It's also one of the best places in the park to go for a run, and one of the few trails in Yosemite where dogs and bicycles are allowed. For all its attractions, there's hardly anyone here. This little-known grove of Giant Sequoias is actually about 20 miles outside Yosemite's south entrance, but it's worth a visit. Less crowded than any of the groves in Yosemite itself. Another just-outside-Yosemite hike, 22 miles (35 km) from the Tioga Road (eastern) entrance. The surreal tufa towers here would still be waiting for Cousteau if Los Angeles's water rapacity in the 1940's hadn't lowered the lake by 40 feet and exposed them. If you're a photographer, this is a definite top-10 hike. Do this trail at sunrise or sunset if you can. Central-Park-crowded because it's an easy hike in Yosemite Valley, but the scenery doesn't merit the attention it gets - Mirror Lake is not, in fact, even a lake, but a pool in Tenaya Creek. In its defense, this hike is much better in the winter. It's snowpack, not schizophrenia, that lands this hike on both the best-of and worst-of lists. Yosemite Falls usually disappears by autumn - during radically dry years like 2007, it can expire by the end of July - and like KISS without their makeup, a waterfall loses its mystique when there's no water flowing over it.